Chicken Society restaurant in Finchley are chicken spit roasting experts located on Regents Park Road. 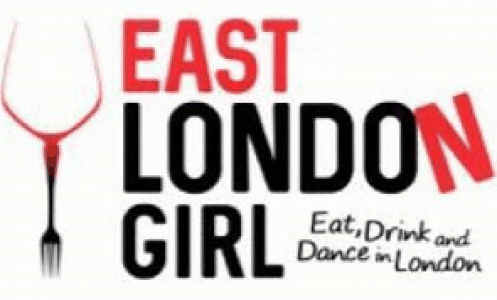 Their specialties are spit roast chicken and duck and they do it well! Their ethos is to stick to simple and do it well. They deliver on this as their menu sticks to a few select dishes but everything we tried was on point. 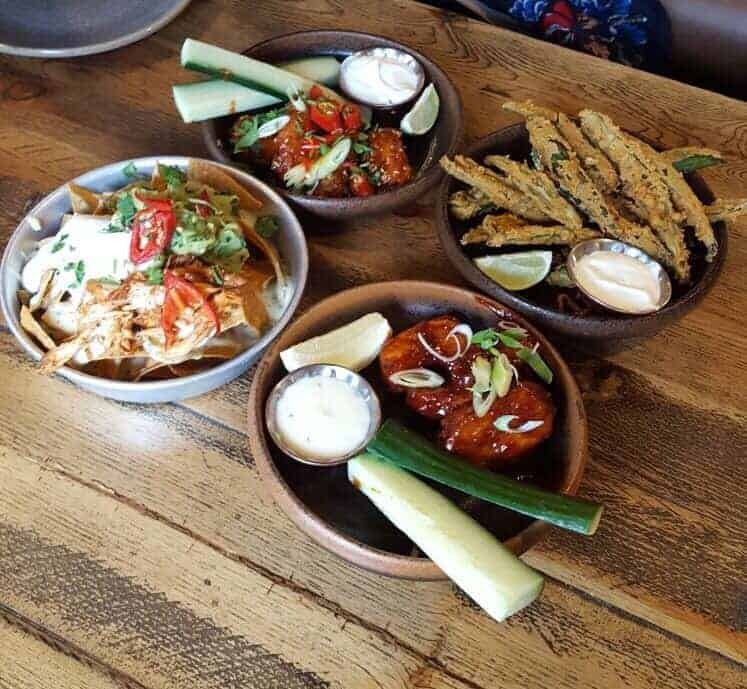 To start with we tried the Boneless Buttermilk Fried Chicken, the Hot Korean style BBQ sauce w/ yoghurt dip & sesame and also the Sweet & smoky BBQ sauce w/ blue cheese dip. The portions were just right and the chicken was very juicy. The Korean BBQ packed a tasty punch but the sweet & smoky BBQ was the all round favourite. Next were the Okra fries w/ lime yoghurt, cooked in a crunchy batter. It had a slow burning kick which wasn’t too overpowering and could be cooled down with the yoghurt. Finally for the starters were the Pulled Chicken Nachos served with crushed avocado, melted special cheese and yoghurt. It was a really generous portion with tasty toppings. 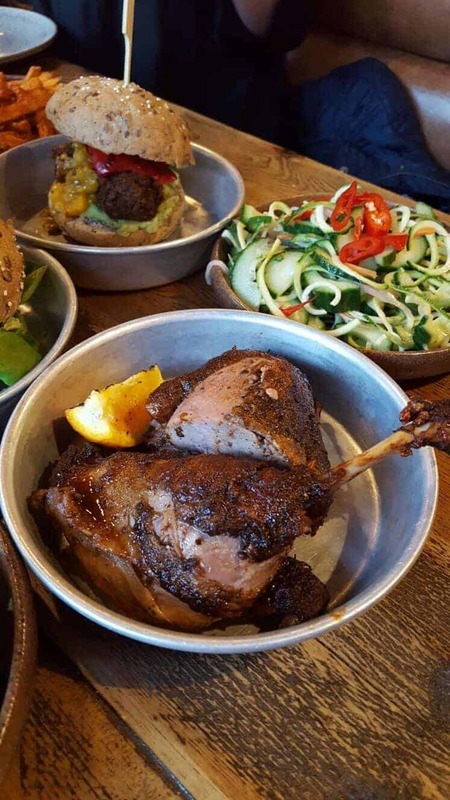 For our mains we got to try the Spit Roasted Chicken: Smoky & piquant, marinated with paprika, lemon, oregano & garlic and the Spit Roasted Duck : Sweet & aromatic, marinated with paprika, five spice, garlic & cayenne, dressed in a plum glaze. Both meats were so tasty and juicy – we were very impressed. 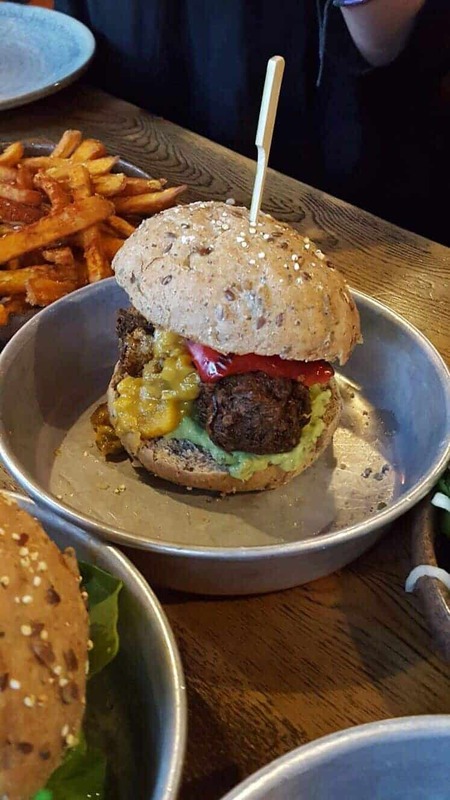 We also tried the veggie option, The Vegan Burger : Kale pakoras, coronation squash, almonds, red pepper & smashed avocado, ancient grain bun. It was one of the best things we ate! Such a surprising tasty vegan burger full of flavour and really good value. 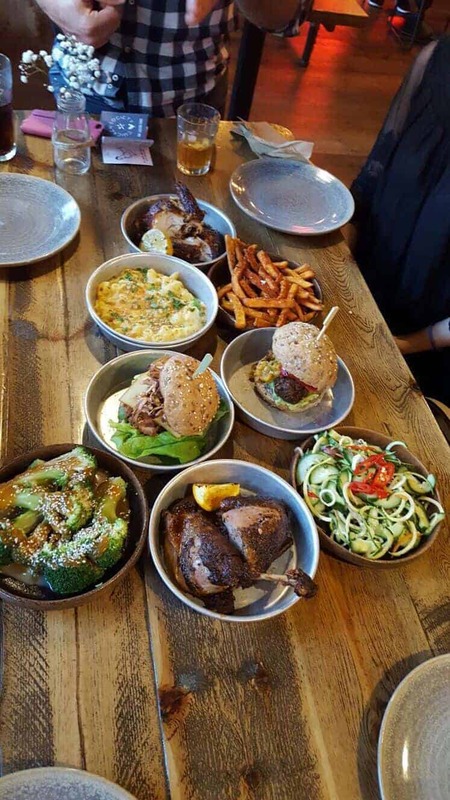 If you ate in Chicken Society with a veggie or vegan friend they would not be missing out at all. 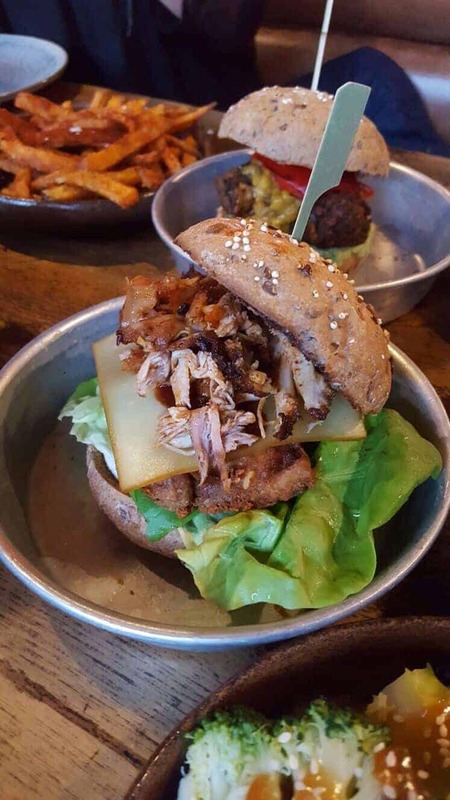 Finally for mains we had the BBQ Chicken Burger: Boneless buttermilk fried chicken, pulled chicken, smoked cheddar, BBQ sauce, ancient grain bun. This burger was really juicy and tasty and the seeded bun was an interesting twist on an already winning burger. For our sides we had : Broccoli with miso & sesame – this was new to us, with interesting flavours that we have never tried before. Next up the Mac & cheese w/ smoked cheddar packed full of salty smoky gooey cheese was very tasty and a decent portion. The Vietnamese style saladwas a really refreshing lovely little salad with cucumber, courgette and pickled mooli. Finally we tried the Sweet potato fries a decent portion, tasty crispy fries with a hint of paprika – the perfect accompaniment. 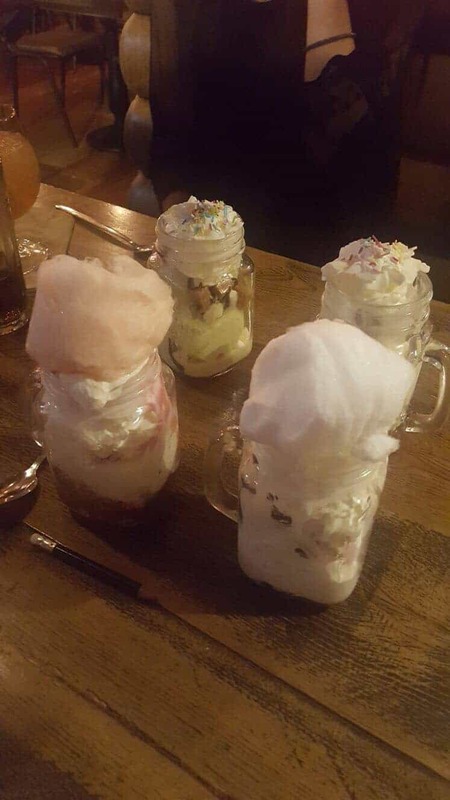 We were already groaning at the sides when we were asked about desert but Chicken Society have a trick up their sleeves….Society Sundaes! You can make your own sundae for just £5! An absolute bargain and our sundaes were amazing. We tried various ice creams – our favourite being Stracciatella with chocolate sauce. The toppings we chose were fudge (super delicious and soft) marshmallows and candy floss which was so tasty! A perfect and fun way to finish off our meal. 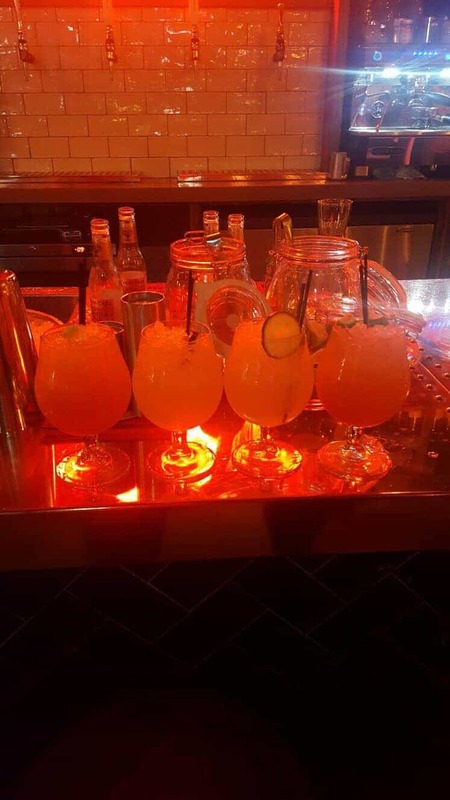 Alongside our awesome food we tried a couple of cocktails – the Society Grog: A wicked bend of dark & gold rums, orange liqueur, passionfruit & lime, lengthened with ginger ale and Elderflower Rickey: Ketel One vodka served long with elderflower, lime & cucumber. Both were awesome and if you visit make sure to ask Ben the bartender to do a magic trick for you – he blew our minds!